Groundbreaking study sheds light on the availability of recycling programs in the US and the acceptance of 49 types of packaging. 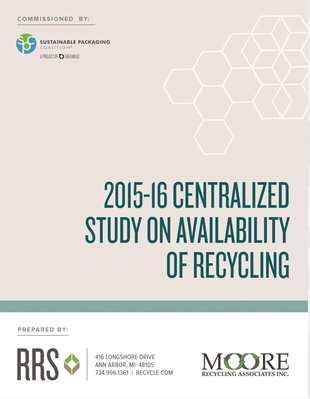 CHARLOTTESVILLE, VA, July 26, 2016 – Results from a study of the national availability of recycling programs have been released today, an industry collaborative announced. The study examined the prevalence of consumer recycling programs across the United States and the acceptance of 49 types of packaging in those programs, which provides substantiation data for packaging recyclability claims and paints a national portrait of the characteristics of recycling programs offered to consumers. Curbside programs are available to 73% of the US population, with 53% of the population having curbside recycling “automatically” provided at their home, while the other 20% has a type of subscription or opt-in recycling program available. For 21% of the population, drop-off recycling programs are the only programs available. Of the portion of the population with a subscription or opt-in curbside recycling program available, about one third are estimated to elect to participate in the program and receive their curbside receptacle. Taking into account estimates of the portion of the population that elects to participate in subscription or opt-in curbside recycling programs, 60% of the US population has a curbside recycling receptacle. Almost 90% of residents with single-family curbside recycling programs now have single stream collection. Only 21% of the US population is estimated to live in communities providing a uniform collection program to residents of all building types – single-family homes, small multi-family buildings, and large multi-family complexes. Large rolling carts for recycling collection are now used by at least 44% of residents with single-family curbside recycling programs, and are used by more programs than use traditional recycling bins. “This study reaffirmed that the vast majority of Americans have an opportunity to recycle, but it also highlights the fact that convenient access to recycling is far from universal”, said Keefe Harrison, Executive Director of The Recycling Partnership.“Now we have a national benchmark and an imperative to carry this collaborative momentum forward and improve these recycling programs”. 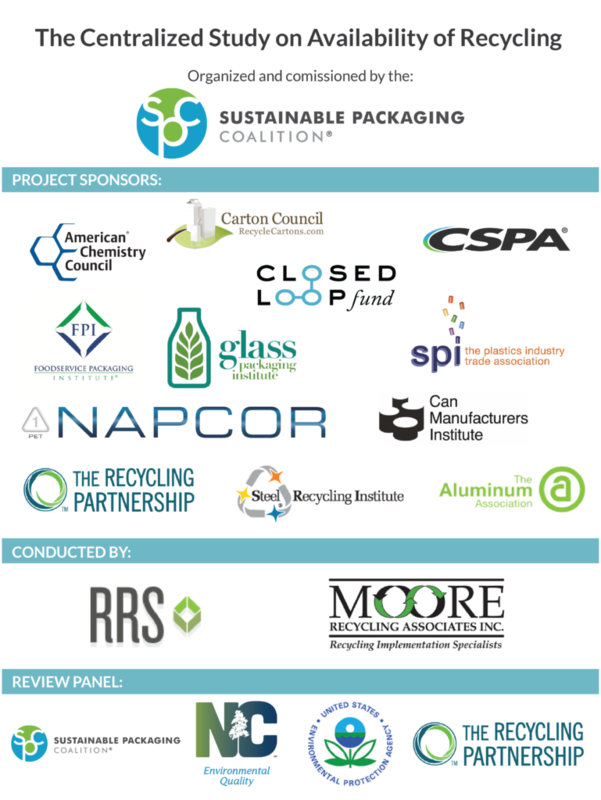 The study’s findings on the acceptance of 49 types of packaging in recycling programs provide important substantiation data for industry to make recyclability claims in compliance with the US Federal Trade Commission’s guidance for environmental marketing claims. National acceptance rates for every packaging type studied are given in broadened figures in the study’s main report, and detailed information on acceptance rates are presented in a series of reports issued to the various project partner organizations. “This effort to create a point in time snapshot of recycling availability for 49 different material types in recycling programs across the country is a great step forward for the project partners,” said Jim Frey, CEO of Resource Recycling Systems. “Their experience working together to both fund the study and now share the results leads to progress on a long term goal of improving not just the availability of recycling services but their overall success in capturing those recyclables”.